The ever-present impact of negative stereotypes on black women in all industries undoubtedly creates barriers in terms of development and advancement. These barriers can come from actual social or institutional prejudices, or self-limiting attitudes caused by the perceptions of others. Two young women are using their voices to help black women in higher education systems in spite of those stereotypes and misperceptions. Erica Wallace and Ariel Cochrane-Brown met in graduate school at Clemson University. Both had a determination to help people with real, or perceived, limitations break through academic barriers. Wallace and Cochrane-Brown were looking to make a difference by assisting students with the challenges they faced while in college. They also shared a passion to overcome the stereotypes that block black women at all levels of higher education. For some time, they were troubled by the lack of resources and initiatives available to women of color in higher education. “There is much attention given to men of color and their retention. While retention is extremely necessary, the issues of women of color often go ignored," Wallace said. 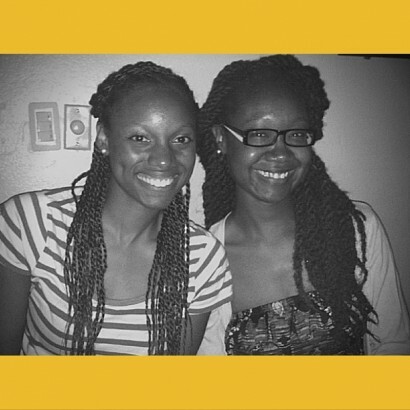 Photo: Courtesy of Erica Wallace and Ariel Cochrane-Brown After watching the 2013 BLACK GIRLS ROCK! Celebration on BET, Wallace was inspired to address the issue head on in an upcoming women’s leadership conference at Clemson. “Watching black women and girls affirm and validate each other made me realize how rare but also how powerful it was to see that in the media on a national scale.” Together, Wallace and Cochrane-Brown developed the well-received presentation, Counter Narratives & Self-Definition: The Holistic Development of Black Women in Higher Education. Drawing from their personal experiences and works such as Patricia Hill Collins’ Black Feminist Thought: Knowledge, Consciousness, and the Politics of Self Empowerment, and Kimberle Crenshaw’s Black Girl’s Matter report, the women later reworked and revised the presentation with hopes to present in front of a national audience. In early February, the opportunity emerged. Cochrane-Brown and Wallace will give their presentation at the 29th annual National Conference on Race and Ethnicity in American Higher Education this summer in San Francisco. There they hope to reach all black women in higher education — Students, faculty and administrators. Many black women in these fields have likely had experiences where they have been judged as angry, bossy or unable to take criticism well. However, these women decided to approach this issue from a different angle. “This presentation is not to highlight all of the negative stereotypes of black women but to challenge us and others to understand and respect that if nothing else, all of the images are not accurate for all black women,” Cochrane-Brown said. Through the interactive nature of the presentation, the two hope to create a dialogue that is “liberating, vindicating, empowering and thought provoking.” They hope that all attendees and participants can engage in the conversation and connect bases on shared experiences. Counter Narratives is a an opportunity for people to explore ways to propel themselves in their lives and their careers by changing the story that says black women are held back by negative characteristics, be they real or imagined. Cochrane-Brown hopes this kind of dialogue will help cultivate more unity and support among black women in higher education. “I would like to see us uplift one another and break through the ‘glass ceiling’ we sometimes hit working in this field. One thing I appreciate about my friendship with Erica is that she truly embraces the fact that there’s room for us all to shine,” she said. Referring to themselves as “colleagues and soul sistas,” both women acknowledge that there are times when we might subscribe to some of the stereotypes associated with black women and have struggled to make peace with that. “I realized in an effort to emulate some of the more positive images of black women, I was putting myself into a category nonetheless — a category that was limiting, and did not encompass me as an individual," says Cochrane-Brown. Photo: Canva Wallace followed by saying, “One thing I have had to learn how to do — and am still learning to do — is to acknowledge every part of who I am, even the parts that sometimes I would rather hide or ignore. There is this quote that I found on Pinterest that I have saved in my phone: “I am not afraid of my truth anymore, and I will not omit pieces of me to make you comfortable.” She went on to talk about how she has pushed herself to challenge limiting perceptions while still walking in her truth. Wallace and Cochrane-Brown intend to make a social and institutional impact with their presentation. “I would like to see similar institutional support given to black women and other women of color that has been given to men of color. There may not be the same challenges in terms of retention, but there are definitely other issues that need to be addressed. Additionally challenges exist in the retention and upward mobility of black women faculty and administrators that should be addressed as well.” As they prepare to take San Francisco in May, they have a host of other things on in the works. Ariel Cochrane-Brown is completing the coursework portion of her PhD program at North Carolina State University and hopes to defend her dissertation proposal by the end of 2016. After teaching first-year seminar courses in Fall 2015, she hopes to add a graduate level course to her roster. In addition to serving as both student and teacher, she’s currently working on several research projects at NC State and Presbyterian College in South Carolina. Just up the road, Erica Wallace is preparing to support a new entering class at UNC-Chapel Hill through mentoring programs and working on implementing campus-wide programs and initiatives for women of color. With the help of some of their friends from graduate school, they’ll also be launching alloftheseats.com, a blog dedicated to addressing various issues in higher education. It’s clear the pair have a passion for making a difference in high education. Keep an eye out for them as they have more in store to help and encourage the success of black women in higher education.